The LinkActivated event will be triggered when your game is started or resumed by a Deep Link or Domain activation. You should be seeing the exact puzzle as seen below. On some platforms, the operating system asks the player what app she wishes to use after clicking a custom URI, the Display Name allows you to configure what name will the OS show on that occasion. The Steam App Id is for Steam only games, you can read about Steam integration on its section. The plugin allows you to configure the deep linking and domain association globally or per platform. If you are using the same custom URIs and Domains for every platform, you only need to setup it once and the plugin will automatically propagate all data to all platforms as you build for them. Scheme - it can be anything you wish, remember to check the Stores for other apps or games that are also using an URI you wish to adopt (when configuring for deep linking), for domain association it's usually http, if your site supports https add another entry to the list. Note: if you are thinking on redirecting a user to a deep link on the web, the scheme should always be configured in lower-case. Path - some platforms support which paths the application should be activated, but usually this is accomplished using other configuration files see Domain Association. When you wish to override any configuration for a specific platform you can do that by clicking on the specific platform checkbox. After that, you just need to fill out the Deep Linking and Domain Association data or leave it empty if you do not wish to support these features for that specific platform. 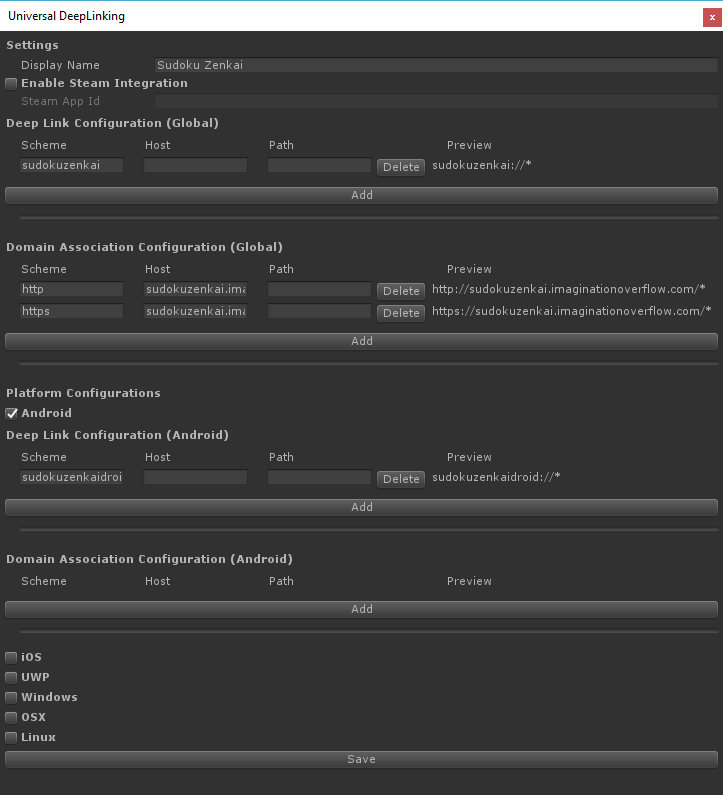 Note that by checking a platform none of the global configurations will be used for that specific platform. In the example above, we've changed the Android Deep Linking scheme to sudokuzenkaidroid and disabled the Domain Association capability. The remaining platforms will continue to use the global configurations. After your game is deployed to a device, you can test the integration simply by clicking on a configured URI on any app or website. As an example, you can send yourself a message (on any messaging app) or an email with the proper URI. We included a simple interface where you can test your deep linking activation without deploying, you can insert any valid and invalid URIs in order to test your integration. When you press Debug, the LinkActivated will be triggered and your callback called if the application is running in the editor. xcrun simctl openurl booted "[MY_URI_HERE]"
xcrun simctl openurl booted "sudokuzenkai://dailychallenge?q=ZMORw4TDhcOKw4fDisOKw43DhcOFw4TDiMOEw4TDhMOEw4TDhMOEw4TClA=="
xcrun simctl openurl booted "https://sudokuzenkai.imaginationoverflow.com/dailychallenge?q=ZMORw4TDhcOKw4fDisOKw43DhcOFw4TDiMOEw4TDhMOEw4TDhMOEw4TClA=="
adb shell am start -W -a android.intent.action.VIEW -d "[MY_URI_HERE]"
adb shell am start -W -a android.intent.action.VIEW -d "sudokuzenkai://dailychallenge?q=ZMORw4TDhcOKw4fDisOKw43DhcOFw4TDiMOEw4TDhMOEw4TDhMOEw4TClA=="
adb shell am start -W -a android.intent.action.VIEW -d "https://sudokuzenkai.imaginationoverflow.com/dailychallenge?q=ZMORw4TDhcOKw4fDisOKw43DhcOFw4TDiMOEw4TDhMOEw4TDhMOEw4TClA=="
You can use windows run program to test your integration, just click on the Windows Button and R and place your URI on the command option and press Ok.
On Linux you can use the xdg-open command to test your integration, open up a terminal and run the following command. If you make your Mac builds on MacOS the plugin will automatically configure everything that is required in order for it to work correctly. But if you make your MacOs build on Windows you will need to do some extra steps in order to fully configure your build to receive deep link activations. Due to Unity limitations, you will need a Mac or a MacOs VM in order to completely use the plugin capabilities. 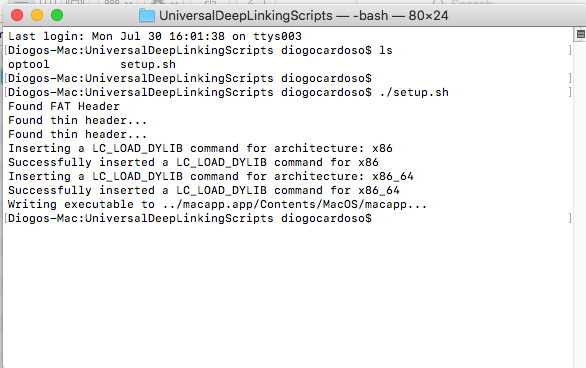 Copy the UniversalDeepLinkingScripts and your deliverable (you_game.app) to your Mac or VM. Open a Terminal and navigate to the copied items location. For more information on why you need to do this extra step check our Inside the Plugin Section. 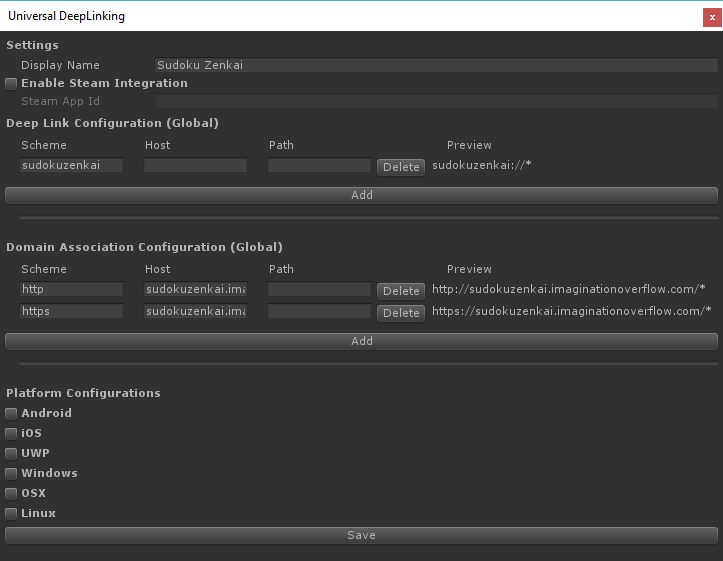 On Windows and Linux standalone builds, the Deep Linking is only configured when the game runs the first time, so even if the player has the game installed on his machine, if he didn't play at least one time, the Deep Linking connection won't activate the game. 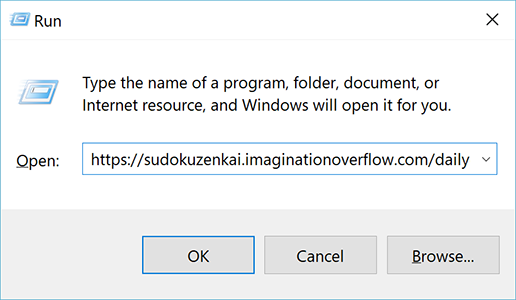 Windows and Linux builds also only allow players to start your game via a deep link if the player clicks on a deep link after your game is already open the plugin won't react to this new activation. For further details on why this happens, you can check our Inside the Plugin Section. 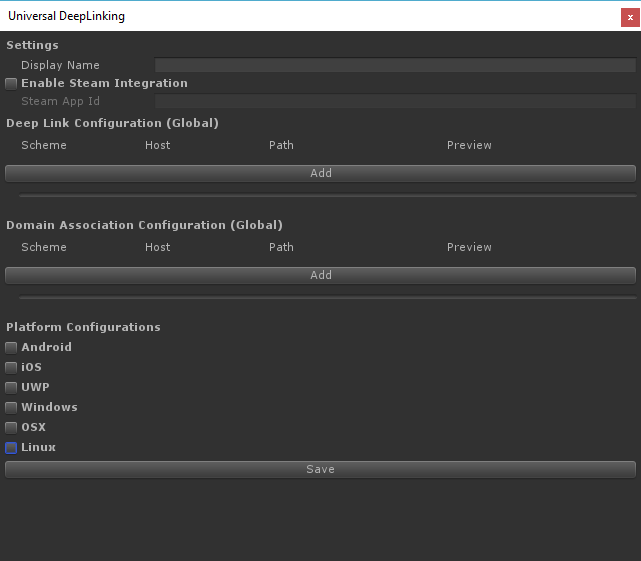 If you are targetting a platform that the plugin doesn't support, you will find that building to an unsupported platform will yield an error stating that the assembly ImaginationOverflow.UniversalDeepLinking.Platform.dll is not present. To fix this you will find a dummy assembly under Assets\Plugins\ImaginationOverflow\UniversalDeepLinking\libs\Dummy, configure it to be included on the unsupported platform that you are targetting and the error should be fixed.